There is something uniquely attractive about open space in a closet. When was the last time you saw a staged photo of a closet stuffed to overflowing with clothes? Rarely, if ever. Instead, clothes hang neatly and are organized tidily–with room for air and energy and open spaces. This is attractive to most of us. But our closets look very different. They are stuffed full of shirts and pants and shoes and belts and jackets. We run out of hangers or shelf space, and then we shop for storage solutions so we can store even more clothes. Our closets become cluttered all too quickly. Still, we are drawn to the idea of the thinned-out closet. Of course, a streamlined wardrobe offers more benefits than simple beauty. It saves time in the morning (and sometimes, the evening). It reduces stress and frustration. It saves money. There is a special pleasure reserved for those who look in their closet and love everything they see. 1. Start easy. Begin by removing the clothes that are stained, ripped, or faded beyond recognition. Items that are no longer in wearable condition can still be donated. 2. Remove seasonal items. Remove off-season clothing from your closet to free up some needed space. If you didn’t wear an item at all last year, get rid of it. Then, store the remaining pieces in a separate closet where they will not be in your way cluttering up your closet. 3. Get rid of clothes that don’t fit once and for all. If you’re in-between sizes, certainly keep some clothing from both. But if you haven’t cleaned out your closet for quite some time, there are likely a number of ill-fitting items that can be removed entirely—whether you changed sizes, the item shrunk or stretched, or it never did fit quite right. Those ill-fitting items are weighing you down physically, mentally, and emotionally. Pass them on to someone who can use them. 4. Reduce your need for additional accessories. If you’re holding on to something until you find the “perfect accessory,” let it go. Clothes often multiply in our closets because of the Diderot effect (one purchase leads to another, which leads to another). In the future, look for pieces that compliment your existing accessory pile. After all, if you’re constantly adding things to your closet, you’ll never get ahead (not in your closet and not in your checkbook). 5. Consider the idea of one. If one can be enough, embrace it. Rather than owning an entire assortment, try owning just your favorite black dress, belt, handbag, or jacket (just to name a few ideas). A closet filled with only things you love and use will be a closet that you love to use. 6. Reassess current trend purchases. The fashion industry gets rich on one principle: constantly changing fashion trends. You see, the fashion industry cannot survive on people buying only the clothes they need. So the industry invents false need by boldly declaring new fashion trends and colors for every changing season. But you don’t to have fall for their tricks. Find your favorite timeless fashion and start playing by your own rules. 7. Physically handle every item. If you want to make significant progress thinning out your closet, remove every item entirely from the closet. Return only the pieces you truly love. If that task seems too overwhelming, complete the process in sections (i.e. shoes today, shirts tomorrow). However you seek to accomplish this project, it is important that you physically handle each item at some point. The physical touch forces decisions. 8. If all else fails, pick a number. To start, choose 10. Thumb through the clothes in your closet and remove 10 items—any 10 you want. Put them in a bag and drop off at your nearest donation center. Likely, you will find the task was not that difficult. In fact, once you get started, you may find 15 or 20 things to remove without even breaking a sweat. 9. Experiment with less. Test your assumptions about the optimal amount of clothing with a few, simple experiments. Try placing half of your clothing in a different room for two weeks. You will be surprised how much easier is to function and get ready with fewer clothes in your closet. Most of us wear 20% of our clothing 80% of the time and would live much happier with fewer wardrobe choices than we have now. But you’ll never realize that until you test it out. There are many reasons the capsule wardrobe movement continues to grow. A thinned out closet is less stressful, less time-consuming, and more convenient. You’ll love it once you experience it yourself. And there’s no time like the present to get started. Yes yes yes to number Six! Isn’t it crazy how we let people we don’t know tell us our clothes, cars, even our couches are out of style?? And believe them? Yes! That’s why I stick with “classic” pieces. Then I take good care of what I buy so it lasts as long as possible. I had a peacoat that looked great for ten years before it finally wore out beyond repair. I agree. Often what is on trend doesn’t suit me or my tastes at all. I do a lot of my clothes shopping secondhand for this reason. Like your peacoat, I’ve got some great clothing that I have been wearing for years – I am so nervous about not being able to find good replacement pieces when they finally wear out. I went on a mission a couple of years ago to thin out my wardrobe and it has been very liberating. My clothes only take up one side of the wardrobe. I decided to adopt a capsule wardrobe where I can mix and match the colours. I only have three cardigans and around 5 dresses that I mix and match throughout the year. Love minimalism and I’m trying to embrace it more. Your blog is very inspiring! Love it!!! I started minimizing about 6 months ago and I am actually having fun giving things away and my son, sister and others are loving it! I started with going through my clothes closet and then made a commitment to get rid on at least one thing a day whether it be a big knick-knack or small bobby pin. I also painted some of my rooms which made me go through more things. I am still learning but I am loving my freshly painted clutter free home. Thank you Joshua and God bless you! I moved houses 11 times in as many years and dragged my entire wardrobe along; plus added to it with each move as I couldn’t find my rainboots/workout wear etc and kept buying new stuff. With my last move I donated 7 full boxes of clothes and shoes and still somehow ended up bringing 14 boxes with me. I ended up apologising to my family and friends who helped me move on the sheer volume of my stuff. It was over 40 boxes and I’m just 1 person! After settling in in my new digs I’m trying to reduce; I just cannot live with all of these items around me, it’s exhausting! Clothes and shoes are hard togive up when they’re still new/unused/designer brands/”might come in handy if invited to certain event” etc etc. I have so many “if my life was different I’dwear this”-items it just baffles me. I read the Marie Kondo book on decluttering and started purging my clothes (not by having it all out on the bed as she suggests, my wardrobe doesn’t fit unless the bed in question is sized like a field). Donating makes me feel better about not having used $$$ items but there is still a lot of work ahead. I long for a wardrobe that makes me feel excited about what to wear, not exhausted. One where I can remember what I have and where it’s stored. Actually wear most of the stuff. Hope to get there soon! In my head, I refer to it as “the Ikea effect” because of their catalogs where it seems like if you buy their products, you’ll be having outdoor summer parties every weekend and suddenly everything you own will be perfectly organized. Extremely tempting to say the least! You can get cash back for unused/designer brands by consigning to thredup.com. It’s a great site. They’ll send you a big bag for free, with a return shipping label. All you have to do is stuff it and drop it off at your post office. Yes, during spring break I went through my closet and got rid of about 100 items. I have enjoyed going into my closet since then. It is so refreshing to be able to find things and have the clothes hang correctly. I will be doing this again soon. Thanks for your blog. I love it and it has helped me tremendously. Here’s to Living! I began my minimalism journey by decluttering my clothes about 18 months ago. I never realized how bad my “they will fit if I just lose 10 lbs” clothes made me feel until they were gone. As each item left my home I felt more and more relaxed. I actually simplified my wardrobe to the point of an outfit I wear to work and an outfit I wear at home. Same outfits every day. It is such a relief to know what I’m going to wear, how it will look, how it will feel. It probably sounds boring or extreme to some but for me the burden lifted is amazing! For the two sets of clothes person: Glad to hear someone is so bold in our consumer culture. In some countries the people don’t even have that second set of clothes. In reflecting on this, I realize when I backpack I only have two sets (dirty, cleaner dirty). The cleaner dirty is the wear to town set where I hope they have a laundry mat. Both sets get washed while i’m clothed in rain gear! I’m going to give your idea more thought. Thanks for the inspiration. Some great tips on minimizing the closet. This was an area that I had the toughest time convincing my wife to start reducing. She did thin out her closet when we moved in together and she hasn’t complained once since then. It is amazing how we truly don’t need a lot of the stuff we hang onto. Another tip that I found helpful is reflected in the photo at the top of this post, i.e. one of the three hangers is reversed. To see what you prefer to wear, simply hang those items you have worn in a week with the hanger reversed (or two weeks if you like). I not only reduced the number of items in my closet, but also discovered my “look” this way. I heard the opposite of this, hang everything reversed and return any worn clothes the regular way. Anything that is still reversed after a set period of time should go. This is how I can tell which items have been worn in the season. Now to just go ahead and get rid of those things still hanging on the backward hangers. I’m just in the process of doing this now. When I’m done it think I’ll get some nice wooden hangers and have space between items. Removing seasonal items definitely makes sense. It also stops me going out in clothes that are wrong for the season just because I felt like wearing them, and they felt fine indoors. A strangely powerful and freeing method I learned from Marie Kondo’s book is this: say thank you to the item (whatever the item; in this case, a shirt or pair of pants), then say goodbye. We can thank the item if it was a shirt that we wore to threads and enjoyed, and even for an item we bought but never really wore and have a hard time getting rid of because it reminds us we wasted money. We can still thank the item for showing us what not to impulsively buy next time. This method also works freakishly well with getting rid of kids’ toys. Allowing my kids to say “thank you” and “goodbye” has turned the previous scream-and-cry fest into warm gestures and salutations. I had no idea this would go over so well with my kids when I tried the experiment, but man has it ever. While I mention Kondo’s book because it gives you permission to de-clutter, I actually recommend Joshua’s Simplify and Clutterfree with Kids more for an actual how-to. Wow – I think that would really really help me! (So much guilt associated with getting rid of clothes – “I didn’t wear it much,” “it was from my Mom,” “maybe it will miraculously fit soon for some reason”….). Thank you for sharing that tip! I think you just sold me on all those books, too! The Kondo approach also worked for me – both the thank you/goodbye to each item – and also the technique of removing all items of clothing from the entire house and placing them in one huge pile, where every item has to be held, evaluated and then put in its place. This was the only way I would really make progress. I eliminated half of all clothing and a third of books. May do it again in January! I am a reformed clothes hoarder. Over the past 5 years I’ve been able to rid myself of over 10 boxes/bags of clothes. Each year I purge more, I don’t buy many new items and I still seem to have too much. This past month I think I’ve finally gotten down to a reasonable amount and I’m determined to keep it that way! My method wasn’t the fastest but it was the least painful and I still got to the right place eventually. I don’t know where I heard this, but it’s been unbelievably helpful, especially with clothing. I ask myself if I would buy the item now if I saw it in the store, or whether I wish I’d never bought it in the first place, or something along those lines. It helps to circumvent the guilt of the sunk cost of the piece of clothing, which can really cloud my judgement. I’ve also found that I can get rid of about half of any category I sort each time I sort it, and once that slows down and I find myself only getting rid of a few items, it means I’m close to the “click point” (as Konmari would say) of having the perfect amount. Only recently did I finally get my closet to the point that I wanted it, and it’s amazing. I would like to have clothing that works together better than my current wardrobe, but that’s something I’m thinking about for when I need to replace my current items. Great advice for cleaning out closets! Mine is an absolute mess…there is just so many clothes. I hope to get my closet down to only what I will actually wear. What separate closet?! Americans have so much space! I decided not to buy any clothing items during 2016 and I’ve not missed it one bit. In fact, I have loads of extra time to do other things as I’m not browsing (anxiously) the internet for clothes I don’t need or going to the shops so much. I have enough clothes and have thinned out my wardrobe (UK for ‘closet’!). No one has noticed or commented and I still dress well. It’s been truly liberating. I live in the U.K. too. What seasonal clothes? Here in Cornwall there’s often 4 seasons in one day! We rarely have extremes of weather. I rarely shop for clothes. I have a sister (and her friends) who shop—and shop—and shop. They give me their hand-me-downs. I am truly grateful and blessed. My closet is full, so IF I keep something they give me…something comes out and goes to charity. Yes, it great!!! BUT, the downside is, most of the clothes I wear are not really my style. It’s nothing that I would go out and buy (they dress a bit flashy and complicated). It helps me out tremendously and I always have nice things to wear to work. I am having trouble with my minimalist closet. One of the main trouble is cheap clothes, specially winter sweaters. I have a few good quality cashmere sweaters, one of which is having trouble with pilling. Many sweaters i bought ( not cashmere) almost qualify as disposable! They look like rags after one wash. 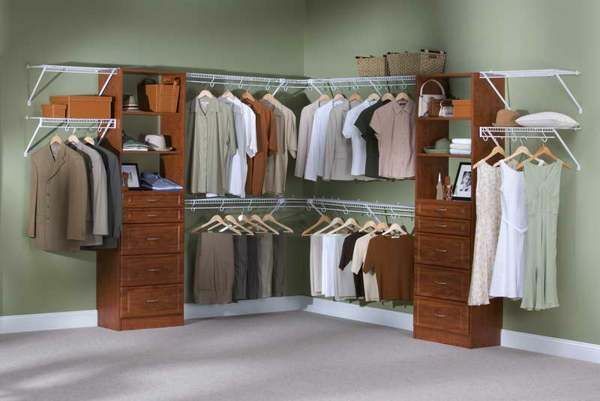 I love the idea of a simple closet with only one or 2 items of each. But cloths are made so cheap now, i find myself constantly worrying about needing to replace the limited pieces. Also i find today’s styles revolting. I want to cry thinking about beautiful ,simple, quality clothing i gave away a few years ago. I spend hours online trying to find some simple quality clothes i like. I know this really defeats the purpose of a minimalist closet! Perhaps shop boutiques rather than department stores. Much better quality and unique styles. Go for fairtrade/biological/ecological. I have good experiences with those! ps; Also carefull washing helps, and not using the dryer also helps. Thanks for these great reminders as I start to clean out my closet and also prepare for future clothing purchases. I just got back from a trip to Italy, it was a gift trip. I wanted to take as few items as possible in a small suitcase. Everything I took was black, gray or white. I mixed and matched and had one scarf with all 3 colors in it. It really showed me how I could live with less and I consider myself a minimalist. Buying one good quality item that lasts is far better than 6 cheaply made items. Fewer clothes with a longer lifespan. I am close to having a near-capsule wardrobe for each season!!! I live somewhere with 4 distinct seasons; there is some overlap in clothes for each one, but not entirely (except Spring and Fall are roughly the same). No matter when, my daily clothing needs to be weather appropriate, since I’m outside for part of my day. So no shorts in winter, no pants in the scorching summer! 2) I can never find things that fit me well! I end up buying things online (not near many stores), but sometimes they don’t fit right. Returning is a pain…so I end up keeping it in my closet forever. Hmm. Hi, Good luck with preserving your clothing. I hate white and black but wear both colors constantly due to ease of laundry. I’d like to share an idea I want to implement in my wardrobe to be more colorful with less laundry issues. I want to buy a few men’s white undershirts (short- or long-sleeve) to take the sweat and deodorant stains then wear my good blouse over it. I’m very cold-natured so this type of layering is good for me. I completely understand!! I have the same problems! Then you find yourself shopping some more!! I have the same yellow stain problem. Nothing seems to work! Try rubbing arm pit stains wth a lemon slice then wash as usual. It worked when my daughter was a teen and only wore white shirts. Also works on rust spots. I have to say, since getting rid of at least half of my closet, I have had way less stress! Honestly, it is so freeing to get rid of something that has been in the closet for a few years that was too small, but I was just hanging onto it ‘in case’. GOODBYE! After a year of decluttering, my family is totally on board. I will come into my bedroom and periodically there will be small stacks of clothing on my bed – meant for the second hand store. It takes a bit of training, but it’s so worth it. Now if I put on an article of clothing and I don’t like how it feels or looks, I take it off immediately and put it into the second hand store bag! Freedom! Love this line, Joshua – “Most of us wear 20% of our clothing 80% of the time and would live much happier with fewer wardrobe choices than we have now. But you’ll never realize that until you test it out.” Great post! I hang all shirts that are not t-shirts, separated between long sleeve and short sleeve. I turn my hangers wrong way out as items are returned and I don’t wear those items again until I have worn everything on a right way hanger. My sweaters are folded in a drawer; they are returned to the bottom of the stack with the big fold to the back and I don’t weather them again until the the rest have been worn. Under wear is folded in a couple of stacks. Wear from the first stack till depleted, slide the second stack forward in the drawer, return the clean stack to the back of the drawer. T-shirts are weeded out regularly and especially if the single stack won’t fit in the drawer. I have 1 pair of chinos and 1 pair of dark jeans for work and a pair of weekend jeans (REALLY broken in). Workout clothes are handled similarly. I live in New England so I have 4 seasons and the seasonal irregularities to account for. At the end of the day I think about how I felt wearing an item, did it need constant adjustment, was it too tight or too loose, and does it look good at the end of the day. If it doesn’t pass this test it is donated. I have just about 2 weeks worth of clothes for winter or summer, but we are good about doing laundry weekly I never run out of clothes. Also I don’t tend to spill food or drink on me so I can get a lot of wearings with pants before they need a spin through the the washer. Wow! Lots of great advice! Thank you! I recently decluttered my closets and the experience was amazing. The practical benefits (less clothes to wade through) were great, but I also gained some insights at the same time. If you’d like to read more, my top 4 insights are outlined in a post titled “Decluttering My House & Soul”. Yes! I did this years ago. I only wear clothes that I really love and that I am happy to wear. Pants too tight? Move on. Holding on to the idea of what size your waist should be will only cause you pain–literal and figurative! And when you do find that comfortable, fitting, flattering pair of black dress pants, pay whatever they want for them, and then wait them four times a week! Re moving your items to another closet – this sounds like such an American solution! In many other countries, people only have one closet (we call it a wardrobe here) and it’s a lot smaller than those walk in things. I find this point doubly interesting as it contradicts the advice of Marie Kondo who advocates putting all your items together so you can see everything you need at once. Perhaps the variations in seasons in the US are much more extreme than in Japan and so having your t shirts to hand mid winter doesn’t make much sense? Anyway, interesting read overall – thanks Joshua. My long haired Kleekai dog (mini-husky) inadvertently helped minimalize my wardrobe. His white hairs stuck to everything, but really stood out on dark clothing. So I got rid of my dark clothes. But, I can’t just rely on my dog’s help, so thanks for the tips in your post! Ha, I deliberately chose a black dog from the rescue centre because my wardrobe at the time was mostly black! :) My brother has been trying to get me to take his jack russell terrier but I really can’t have a white dog. Getting back to the original post, my problem is parting with shoes. It can be hard to give things away when you know that because the world is overflowing with textiles (3rd world countries getting ‘Dead White Man Clothes’ as they call them) and you’d really like your good stuff (even if you don’t wear it) to be re-used and wanted. I just gave away a floor-length brocade coat (with fake-fur trim on the collar and cuffs) to a local Amateur Dramatics group. Sometimes you have to think of other ways to re-purpose your stuff rather than just automatically offloading it to the charity shop (where most of it will go to the rag man or 3rd world). This is absolutely a reason not to buy so many clothes in the first place. I’ve taken to buying fewer, higher quality, American-made clothes (quite hard to find). I wash gently in cold water and hang most things to dry, so they last quite a long time before I need to replace. Most things can be worn more than once before washing, as well (it amazes me how some people change their clothes more than once a day and put everything to be washed — they’re drowning in mounds of “dirty” clothes and need a huge wardrobe of clothing to support their laundry habit). I spent the weekend doing this very task. I found I had clothes in my closet that were 10 years old! Ten years! Needless to say, I got rid of quite a bit. Ended up with over 6 bags full of clothes. My biggest problem is the idea of just one. If I like a t-shirt, I always buy 3 just in case I get a stain on it. Crazy thinking right? Am I on the wrong site? I got rid of a coat recently that I had had for over 30 years! Yes that’s right 30 + years. I would have kept it if it hadn’t got ripped quite badly. I do get rid of things much earlier though, when I no longer have use for them. I hardly need or desire to buy much. Having less than most people stops me getting stressed. Also, my spare time isn’t running round stores for more things to bring home. I acquired a 3-pc luggage set that I absolutely love and travel with often – that is the 21 and 24-inch pieces. I have only used the 28-inch one time and vowed never to travel with it again SO I repurposed it to hold all my ‘off season’ clothes and some other pieces with sentimental value. When I am ready to do the seasonal change out, I roll it out, exchange items and roll it back away. I have never owned a lot of clothes in comparison to many people. My parents were not wealthy and my husband and I have always had financial goals that didn’t allow me to go shopping a lot. However, I used to dream/think about all the clothes I would buy some day. I had even started to buy a lot more and was building a bigger wardrobe. Then I started reading about minimalism. I decided to try a 30ish piece wardrobe that changed each season. I did this for a time but have since switched to changing it up twice a year. Some of my clothes span all four seasons. I know that some minimalists buy new clothes each season to make things more interesting. We still aren’t that the place that our financial goals will allow that, so I tend to replace what is worn out or something I just can’t stand anymore. Currently, it should be spring but it decided to snow on and off and get cold again here. At this point, I am highly tired of my wardrobe, but somehow even with my smaller wardrobe, there are still some clothes I almost never wear. My biggest gain with clothing is that I almost never think about going shopping or all the clothes I wish I had. What freedom. Freedom indeed. The shops are just full of stuff most of us don’t really need. I’d rather go for a nice walk. I live where there is quite a big difference between winter and summer weather, while spring and fall are similar to each other in temperature. If you don’t fall into the trap of having to wear “spring” or “fall” colors, the same wardrobe can work for both. For winter, I add more layers (a black cotton turtleneck under a spring/fall top, for example, or tights under pants or a skirt) and outerwear (a denim jacket or wool peacoat, for example). In summer, I pull out tank tops, capris, loose dresses. Loafers for spring/fall, boots for winter, sandals for summer. It doesn’t add up to a lot of clothes, but it means I can dress comfortably for all four seasons. And if I want something new to energize my wardrobe, I only need a couple of tops, a new jacket, a new handbag or perhaps a pair of earrings to do that. Once a year, I wear everything in my closet. Front to back, with some allowances for the weather. It’s interesting and responsible. I do that with my church clothes since I don’t wear them many other places, and I certainly have some more than 10 years old. I work alone from home and can wear my pajamas all day, if i want to. But I have lots of “professional” clothes from when I had a regular job. Thinking of keeping a couple blazers and nice dressy blouses, a couple dress pants. I rarely wear skirts or dresses but have so many “for special events.” I was recently frustrated with my socks – holes, stretched out, or they ride down to the middle of my foot in my shoes. I threw these all away! In June a Goodwill is opening four blocks from me. No excuse for clutter. My husband & I share an average size closet (not walk in) and it’s only half full. I loved Marie Kondo’s approach and most of our clothes are folded in drawers. I have 3 pairs of the same shoes. When one wears out, I pull out a new pair. Done. I dress up so much more now that I have fewer items- all of which spark joy! I seriously wish I can get the capsule wardrobe down. My clothes are all over the place in style and colors. I need professional help because I am not helping myself at all. Like a couple of others here I start the year by reversing my hangers at the beginning of the year. When I wear something the hanger goes in the correct way. Any thing on a hanger hung the wrong way has to go. This has really helped. This year I’m trying to also get rid of my large supply of comfort clothes. Those that are too big or stained yet I love wearing them at home relaxing. I’m giving up the too large clothes and making rags from the stained clothes. I should read my reply before posting. Its at the end of the year I get rid of the ones I haven’t worn. My issue is not fighting with clothes that don’t fit, are no longer wearable, etc. My problem is the weather is so unpredictable that I feel that I have to have something that is appropriate to wear for all temperature. In Toronto, Canada, in a year, the weather has been as warm as 37 degrees Celsius and as cold as (with the windshield) – -37 degrees Celsius. Even within one season (for example, now in April), the weather fluctuates a lot! It rains, it snows, its warmer, its colder….Its a never ending battle to try to decide what clothes to keep and what not to keep. Yep!! I live in NE Ohio. Almost the same story here. You have to keep it all handy! My wife’s closet is 50% larger than mine yet she has slowly taken over mine as well, filling nearly 2/3rds of my closet with her clothes. I’m up a creek. Thanks got the article Josh. Every year I hang my clothes with the hangar head facing outward. As I wear the item I replace it with the hangar facing inward. At the end of year, those clothes with the hangar facing outward (indicating no use for a year) get donated. A good reflection of what needs to be changed as pertains my buying habits. As kids we used to have seasonal wardrobes and it was a pain to have to go up and down to the attic to pack and unpack stuff several times a year, especially when I didn’t wear a lot of what I did have. Then I evolved my clothing choices to items I could layer so as much of it as possible spans all the seasons. The very few out of season items I do have go to the back of the closet or bottom drawer until I need them front and center again. Yes, Annie, I do this too. Layering can actually be warmer than just wearing heavier, bulkier clothes, and it allows more clothes to be worn for more months of the year. Hence, a smaller wardrobe! I find myself hanging om to clothes. I have been pregnant twice these last three years and am not happy with my current figure, it means the suggestion to throw away thing I haven’t used in a year doesn’t apply/isn’t helpful, since most things I’m wearing now is for practical/nursing reasons… And the possibility of a third child, I might use it again, and I don’t want to have to buy all those pregnancy and nursing tops again. Anyway – that’s why I struggle with thinning out. Love this. I sold 65 (SIXTY FIVE) Chico’s necklaces on ebay and about 40 pair of earrings – wore them on occasionally. Love having the burden of all this crap lifted from me. I kept pieces I wear frequently and those with sentimental value. I have survived on 23 items of clothing while teaching and working in Malaysia. I rotate my clothes on a 2 week cycle. ( including 2 short and 2 long dresses that I wear alternatively on a Tues and Thurs. Has definately helped having the same climate, but I am proof that it can be done!